Developing Progress Tracking Sheet/System for piping fabrication is one of the tracking system of Progress Measurement System for Petrochemical Plant Project Consruction. 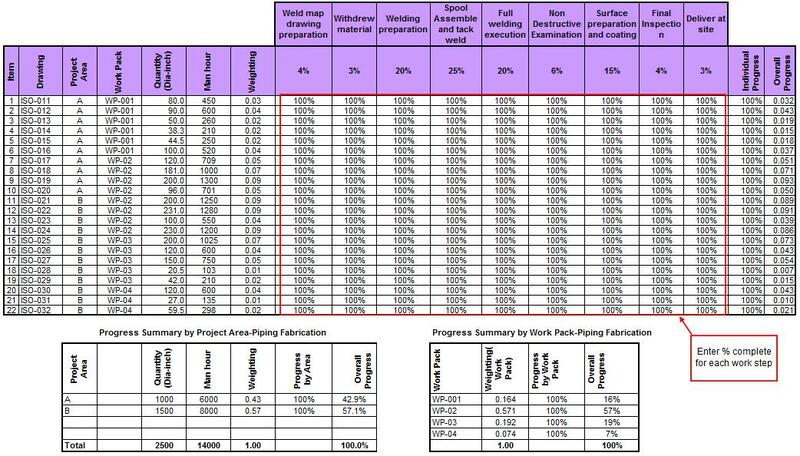 The following table is a sample tracking sheet for piping fabrication. The progress tracking sheet format shall be submitted to Owner’s Representative for approval prior to commencement of the work. As shown in the above table, "weighting" column is inserted to calculate individual progress and overall progress. The individual progress is calculated by the sum of the product of weight step progress and weigh factor %. Overall progress is derived from an individual progress * individual weighting. Progress summary data by Project Area and Work Pack is calculated using SUMIF function. In this post, all the fabrication work steps for all drawings are updated as 100% completed. Get the free excel template to learn more. Hi Router Mill, You are welcome. The third column in your table reads ' withdrew material' . Please can you clarify on this? “Withdrew Materials” work step progress is earned when the materials (i.e. pipe, flanges, fittings, etc.) from the store/laydown yard are taken to fabrication site in order to commence fabrication work. do you also have KPIs for piping & structural fabrication and welding by material class / diameter etc? I am in need a tracking chart to track my welders WPQ's and WPS and PQR's but I also need it to show when they have to requalify for each we are a small specialty chemical pipe fabrication company, besides the welding software do you have any suggestions as to how I can make a chart to track these?